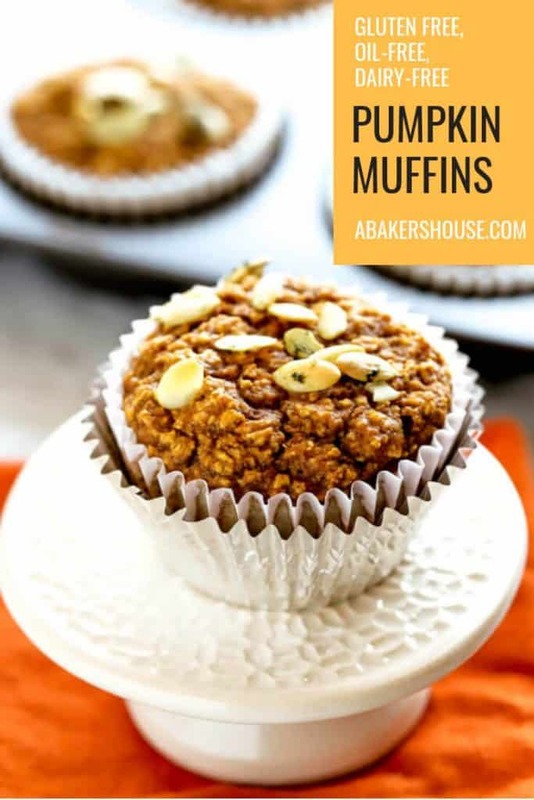 This recipe for healthy pumpkin muffins provides a breakfast option that is gluten free, refined flour free, oil free, and can be made dairy free too. Pumpkin puree and pumpkin pie spice make these muffins a perfect choice as the fall season gets into full swing. Fall is upon us and all things pumpkin are popping up. Pumpkin patches, pumpkin spice lattes, pumpkin bread. 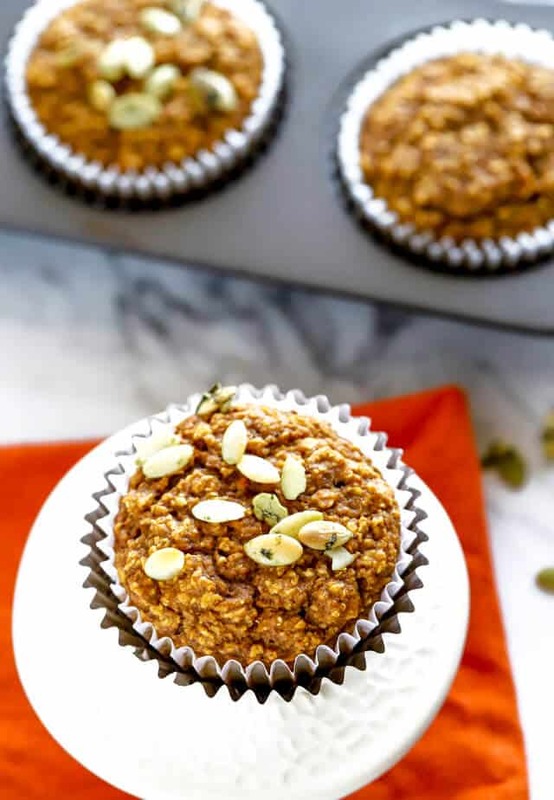 Pumpkin puree is the base for these healthy pumpkin muffins and the flavor is bumped up with the addition of pumpkin pie spice. Baking healthy pumpkin muffins is straightforward. Begin with the wet ingredients: Pumpkin puree, maple syrup, 1/2 cup plant based milk (or traditional milk), and two eggs. 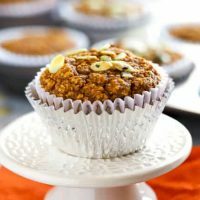 A plant based milk like Silk’s Oat Yeah or AlmondMilk would make dairy free pumpkin muffins quite easily. Do you make your own pumpkin puree? I never have done so and find that the store-bought pumpkin puree in the can is ideal for baking. Check the ingredients on your canned puree and make sure that PUMPKIN is the only ingredient listed. Sometimes companies sell a canned pumpkin pie filling which is NOT the ingredient you want for baking. Pumpkin pie filling has additional sugars and other fillers included. Then move on to the dry ingredients: oats, baking soda, baking powder, and pumpkin pie spice. Gluten free old fashioned rolled oats create an oat flour with a simple pulse in the food processor; no refined flours are used. 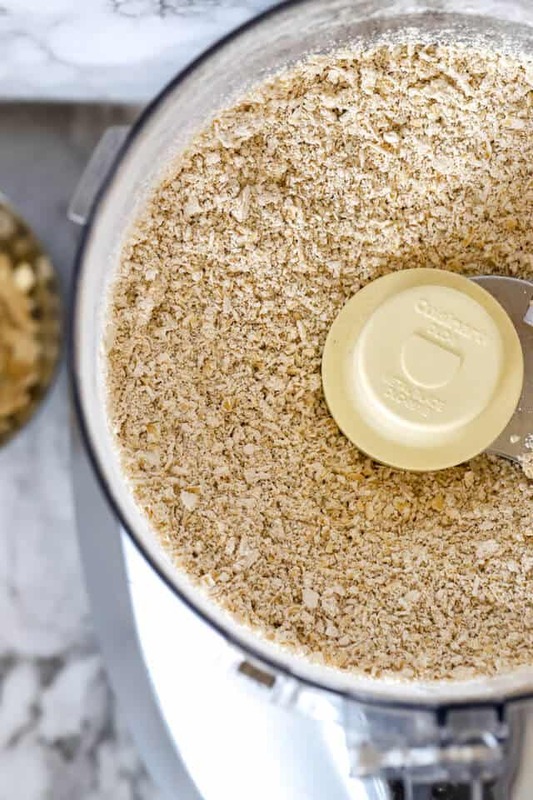 You can buy oat flour but the process of making your own is quick and easy. If you are making a gluten free muffin, double check that your oats are certified gluten free. Oats are naturally gluten free but sometimes in the manufacturing process, gluten can find its way into the product. Therefore only oats that are marked clearly as “gluten free” are acceptable on a gluten free diet. Pulse the oats to a fine flour consistency. 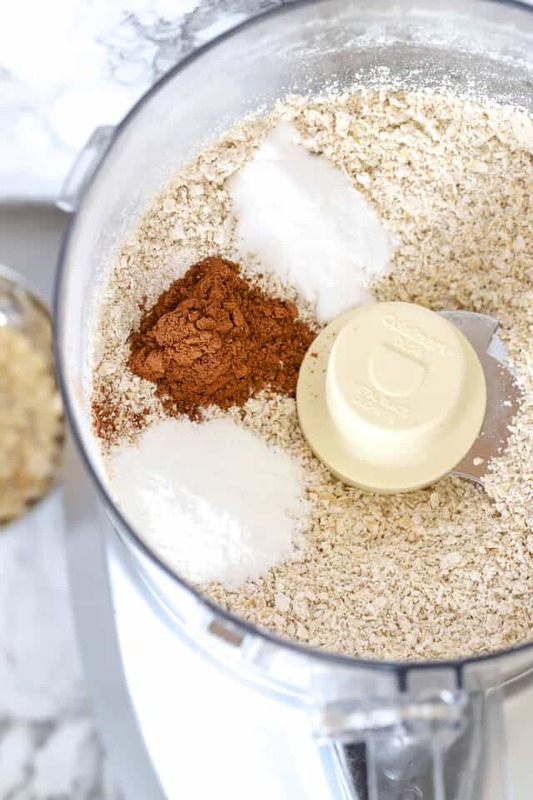 A food processor is your best friend in creating the texture of a flour out of oats. Pulse the oats 10 times then take a look. Repeat the process until your oats are finely ground. Add the remaining dry ingredients of baking soda, baking powder and pumpkin pie spice. You can mix your own pumpkin pie spice with cinnamon, nutmeg, and ginger or you can buy this spice mixture ready-made. Combine the wet and dry ingredients and fill muffin tins with the batter. Take care not to over-stir the batter. Mix until you can barely see any of the dry ingredients left and you’re good to go! Pumpkin seeds (also called pepitas) are an optional topping to add to the pumpkin theme. Recently I’ve found pumpkin seeds in bulk at Costco and I use them liberally– from topping muffins to adding a crunchy, gluten free bite to salads or yogurt, pumpkin seeds are a good choice. You can even save pumpkin seeds from your Halloween pumpkin and roast them yourself. Have you tried this? Let me know! 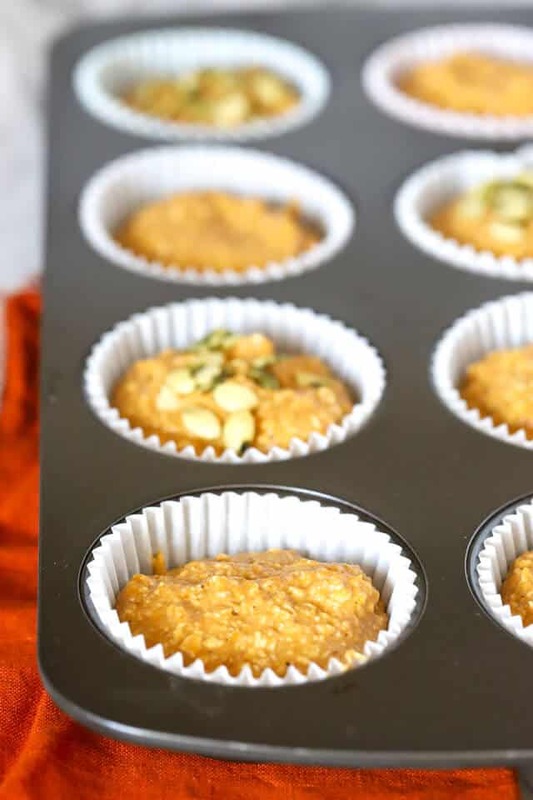 Bake for 18-20 minutes and you’ll have healthy pumpkin muffins ready to enjoy! Pumpkin muffins make a great choice for breakfast on the go. You can freeze muffins and either set them out on the counter overnight to defrost, or you may zap them in the microwave for 10 -15 seconds to reheat. Making easy muffins for your family is a good way to plan out breakfast ahead of time. 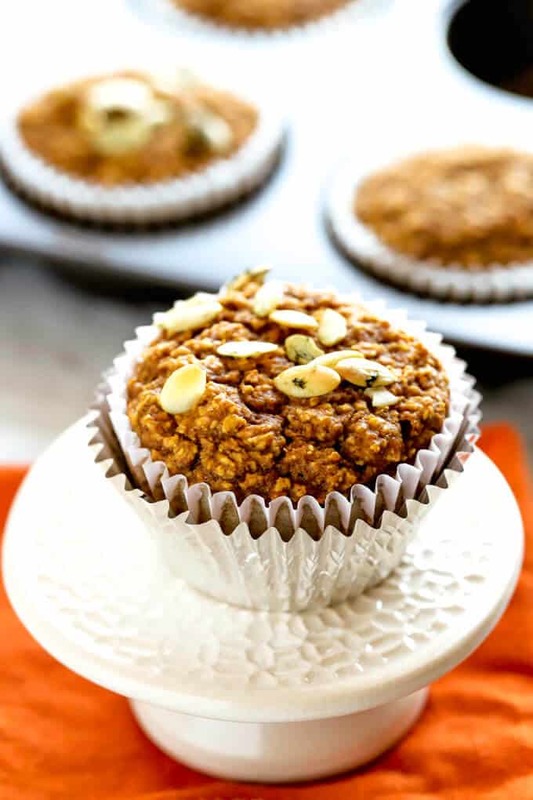 I like these healthy pumpkin muffins for kids or for adults. Mini muffins make a perfectly sized hand-held option for toddlers. Everyone will be happy! The term “healthy” means something different to each person, so even though these gluten free pumpkin muffins are healthy to me, you may have other standards. I get it. We all make choices that work for our bodies. Baking without refined flour and granulated sugar is a step in the healthy direction for me. Using plant based milk rather than traditional milk is another positive step for me in the healthy frame of mind. Maple syrup causes similar swings in blood sugar and insulin. I am not claiming that it is the healthiest option but, again, it is a step in the right direction. What steps do you take on your journey in healthy eating? 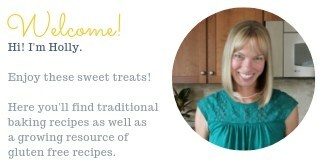 Healthy pumpkin muffins are gluten free, oil free, sugar free, and dairy free. Enjoy! Line a 12-tin muffin pan with muffin cups. 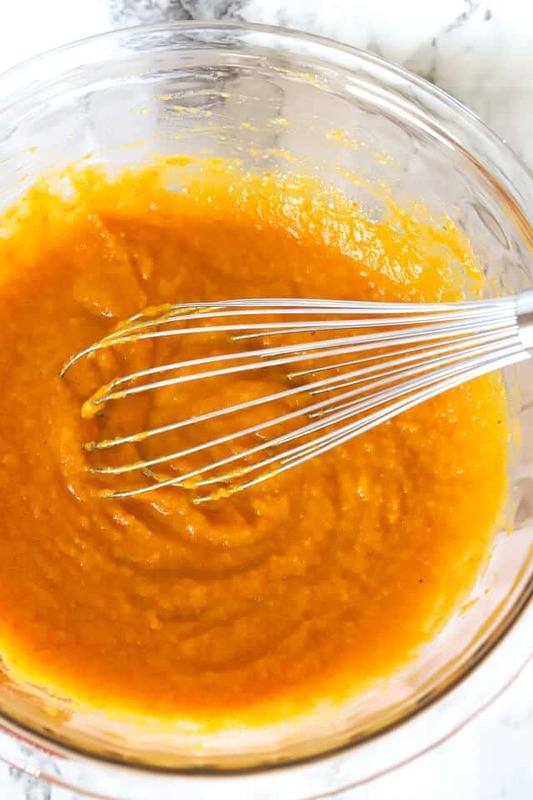 Mix the wet ingredients of pumpkin puree, maple syrup, almond milk, and eggs in a large bowl. Whisk together until well blended. 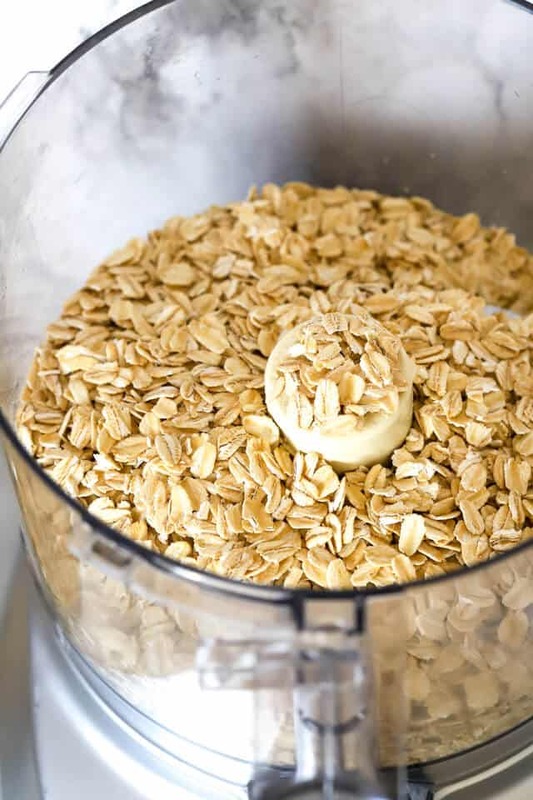 In a food processor pulse the two cups of gluten free oats until they are finely ground like a flour. Add the baking powder, baking soda, and pumpkin pie spice. Pulse a few times until the dry ingredients are well incorporated. Add the dry ingredients to the bowl of wet ingredients and fold together. Scoop the batter into the 12 muffin cups. Sprinkle pumpkin seeds on top of the batter if desired. Bake for 18-20 minutes. Remove and let cool on a wire cooling rack. Bake a batch and freeze the muffins. 20 seconds in the microwave heats them up beautifully! This data was provided and calculated by Nutritionix and is an estimate only. Bake more recipes this autumn with pumpkin, apple, and maple flavors! Pin this recipe to make later! « How to Frost Cupcakes with a Ziploc Bag! Holly they look so healthy and delicious!! Yumm!! Thanks so much! yes, I plan on making another batch of muffins this week. So good! 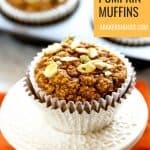 Love these for fall breakfast meal prep. Looks yummy! Yes! Pumpkin muffins are a great start to the day this fall. These look so delish! A great breakfast on the go! I might be guilty of eating one of these in the car this last week– muffins are ideal for on the go when you simply run out of time to sit at the table. I think I need to keep a batch of these on hand for easy breakfasts and to-go snacks! They sound delish! Pumpkin muffins are the perfect afternoon treat at this time of year. These look delicious. I love it when pumpkin season rolls around. Happy fall! I need to bake more muffins! Love all of the healthy ingredients in these! Thanks! A batch of these muffins disappears quickly!